Nvidia, one of the biggest names in the GPU field provided one of the most advanced Geforce cards with its Geforce GTX 970. It was apparently designed for serious gamers who wanted to do some serious gaming. The card features Nvidia’s Maxwell architecture. 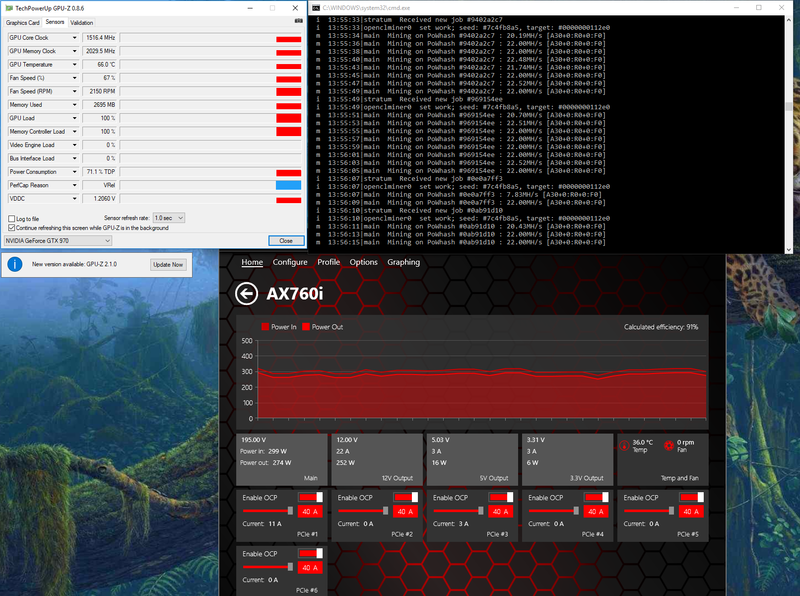 * somebody says he can get 23 MH/s with a 160 Watt power consumption but we have no proof. Some of the Geforce GTX 970’s key features include a 1,50MHz core clock and 1,753 MHz 4 GB GDDR5 memory. It has more than 5 billion transistors abd 1,664 stream processors. It needs 2 6 pin power connectors. The Geforce GTX 970 is right in the center of the range of Nvidia’s latest models, though it has fresh hardware. It has the GM204 core that is used with the GTX 980, although it has 2,048 stream processors and a higher clock base at 1,126MHz. The Maxwell architecture handles power greatly, but its strength is in efficiency. Nvidia went to great lengths to reconfigure this cards stream processors. This means more jobs can be delegated with increases precision. This leads to reduced power consumption and heat generation. It is fighting a difficult battle, however. It has a complete throuput of 3.49 TFLOPS, which is quite impressive. However, the Radeon R9 290 from AMD is cheaper and has 4.84 TFLOPS. The GTX 970 isn’t great with memory, either. While it has 4GB of GDDR5 RAM, 0.5 GB of that is partitioned off into a section used for less resource intensive jobs. This partition is much slower, and leaves only 3.5GB left for your tasks. This is not the only problem, either. Nvidia originally said the GTX 970 featured 64 ROPs and a 2MB cache, when in reality it only have 56 ROPs and a 1.75MB cache. The GTX 970 doesn’t stand a chance against the R9 290 on paper. The GTX 970 has a total memory bandwidth of 223GB/s, while the R9 290 has 320GB/s. The Nvidia GTX 970 is a top of the line Nvida gaming focused GPU, and in use it has notable efficiency. However, it is more expensive than the superior Radeon R9 290 and has trouble smoothly playing 4K games. The power cost to run this GPU in an Ethereum Mining rig is around $0.41 a day. It has a daily return of around $0.82 but will take a long time to pay for itself, around 634 days. Honestly, with the AMD Radeon R9 290 being somewhat superior and also somewhat cheaper, Ethereum miners would be better off with the Radeon R9 290. The Geforce GTX 970 does do a good job at not munching up all of your energy and raising operational costs, however it takes a long time before you see a return on your investment. For that kind of money, you may be better off with a better GPU for your Ethereum mining operation. Regardless of which GPU you choose, be sure to help it out by operating in a temperature controlled room, using fans or air conditioning to help moderate the systems internal heat. Did you like our review? Please help us with a donation! TY!